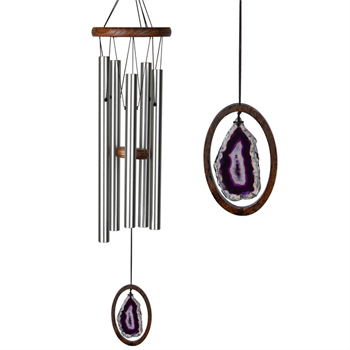 Tuned to an ancient Celtic scale, this chime features a purple agate slice. Purple agate represents royalty, spirituality and enlightenment. On these large chimes, the agate is presented in a frame, so its beauty can be on display to all. May the music of the chimes, combined with this ancient earth energy, bring harmony and balance to your customers' lives.